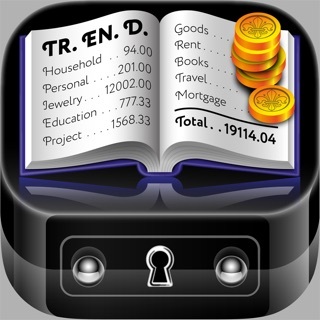 Get the free version of inShort for iOS! Click "inShort Support" to learn more about the offer. This program allows you to build diagrams of processes and monitor their execution. As a rule, tasks do not exist on their own, they are usually interrelated, and the best way to show this is to build a diagram of processes. Almost every task in the program can be drilled down to a separate diagram, until the project is broken down into elementary operations. Having constructed a detailed scheme, you can simulate the future execution of the project, what will become the basis for the planned schedule, which can be compared with the current execution of tasks without leaving the program. You can also place some tasks in the Calendar and set reminders on them. 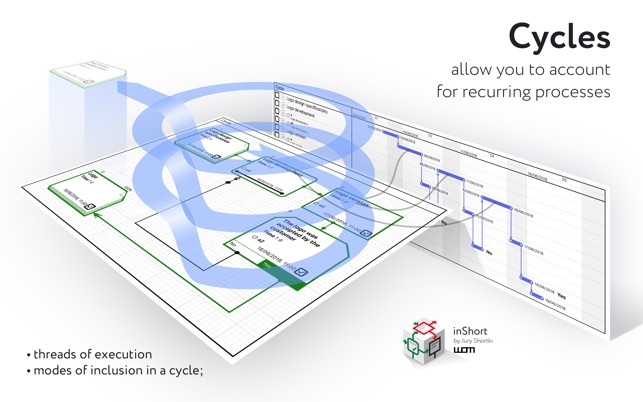 More formally, the program allows you to build a customized, based on the BPMN notation, PERT diagram of the project (with events and processes at nodes). Then this description of the project is used to generate a Gantt chart and track the progress of the project. 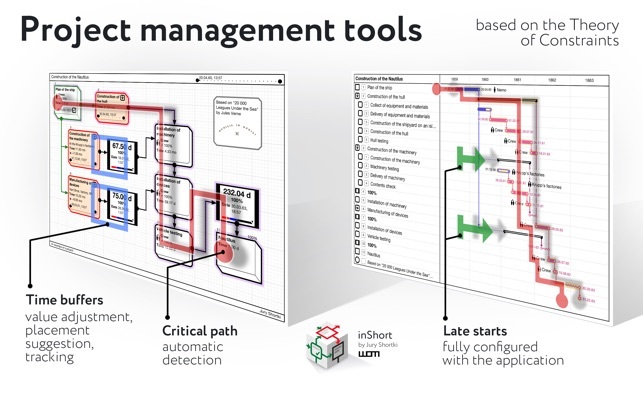 inShort Pro — application version for experienced and advanced users, contains advanced and service functions useful for in-depth work with diagrams. 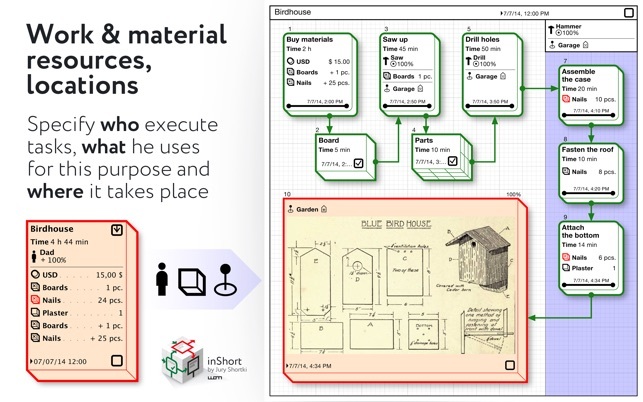 • inReview: publications of user diagrams surveys by experienced project managers, indicating successful findings and weaknesses in the diagrams. 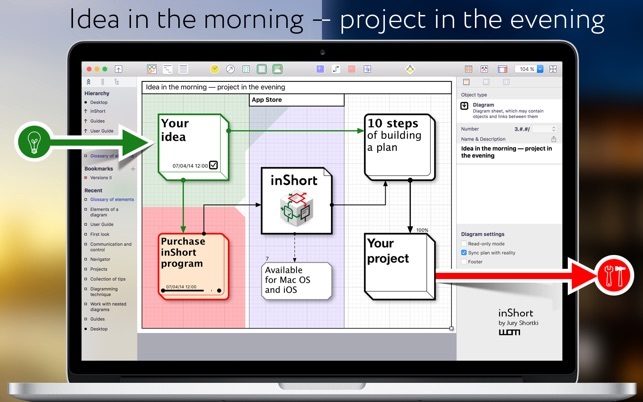 The inShort Pro version is available by monthly subscription. Subscription automatically renews unless auto-renew is turned off at least 24 hours before the end of the current period. So, inShort is a powerful tool to work with projects and business processes, which can be applied not only in office but also for personal purposes. You can further explore the capabilities of the program with the detailed interactive User Guide. You have a difficult task, you do not know where to start and how to approach it. Try to approach it with this program and you'll find out where to start and where to move. You suspect that business processes in your organization are not optimal and you are doing a lot of unnecessary work? Build a scheme of processes in this program, and you'll see what's what. • Building the diagram of processes and resources (PERT network diagram of the project, based on BPMN notation). • Drill down the diagram elements. • Tracking the execution of processes. • Advanced mode of pre-planning. • Integration with the standard Calendar. • Displaying the list of tasks in the form of a Gantt chart. • Separation of physical and information flows. 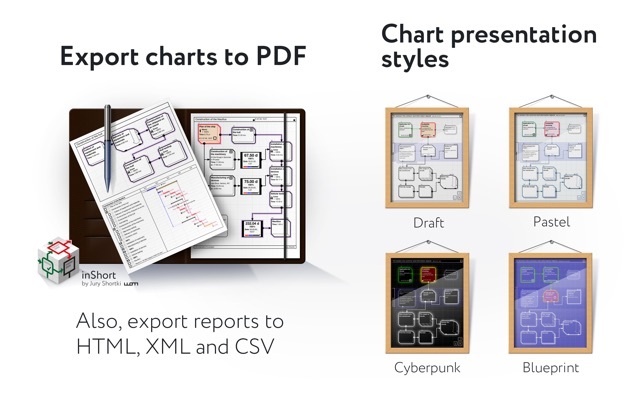 • Export of diagrams into PDF files and OPML outlines. • Ability to specify the expected time of execution, both directly and parametrically. • Working calendars taking into account various schedules of work for implementation of tasks. 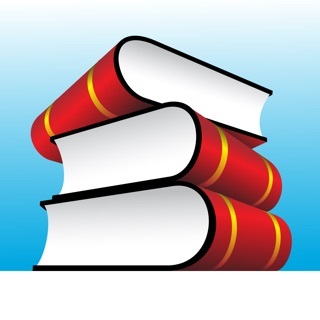 • Work resources and their assignment to tasks. • Material resources, counting the usage of resources by the diagram. 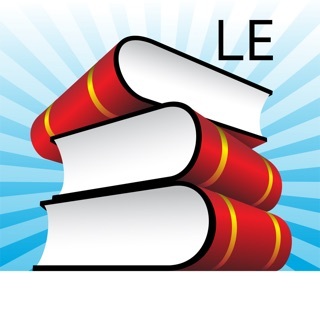 • Localization of work and resources in places. • Queues of tasks: organize the work with active tasks in accordance with the elements of the GTD methodology. 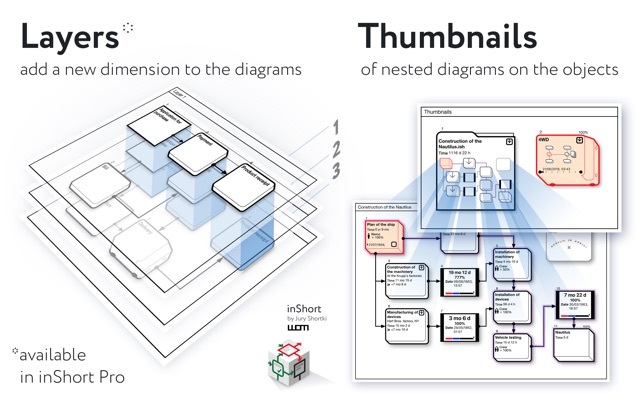 • Control lists for diagrams — monitor the sequence of actions with the diagram step by step. • tracking of time indicators during project execution. Cannot solve a problem? Draw it inShort and sort things out with it there. It's like voodoo but it works. • added a feature of quick comment on the Shift key. 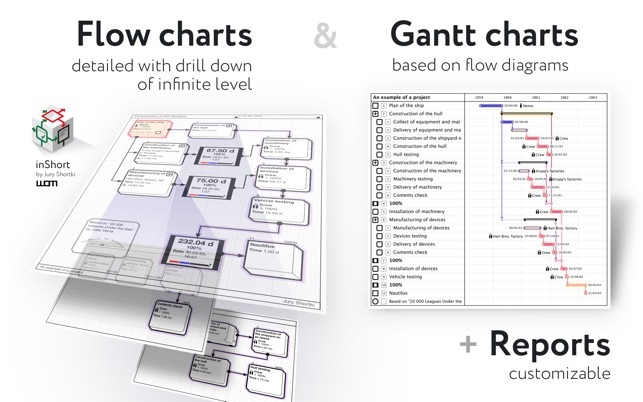 • fixed artefacts when drawing a Gantt chart. We are grateful to all users who leave a review on the application, they are a great motivation for the further development of inShort. Vorkenntnisse in Projektplanung und Workflowmodellierung sind nützlich, ansonsten ist schon eine gewisse Einarbeitungszeit nötig. Aber das Ergebnis überzeugt absolut, werde meine bisherigen Tools wohl "einmotten". Was mir fehlt, ist die deutsche Lokalisierung und eine Möglichkeit Projekte ohne spezifisches Startdatum anzulegen. Einfach zu bedienen - durch die Ordnerstruktur kann man sehr gut auch umfangreiche Projekte planen und behält trotzdem den Überblick. © 2016 Jury Shortki. All rights reserved.